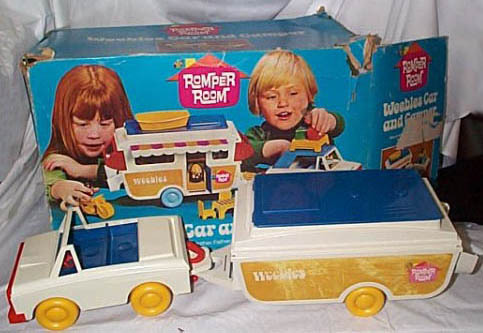 Description: The Car & Camper set was the first U.S. Romper Room Weebles playset to be featured in main stream Christmas toy magazines and toy stores. 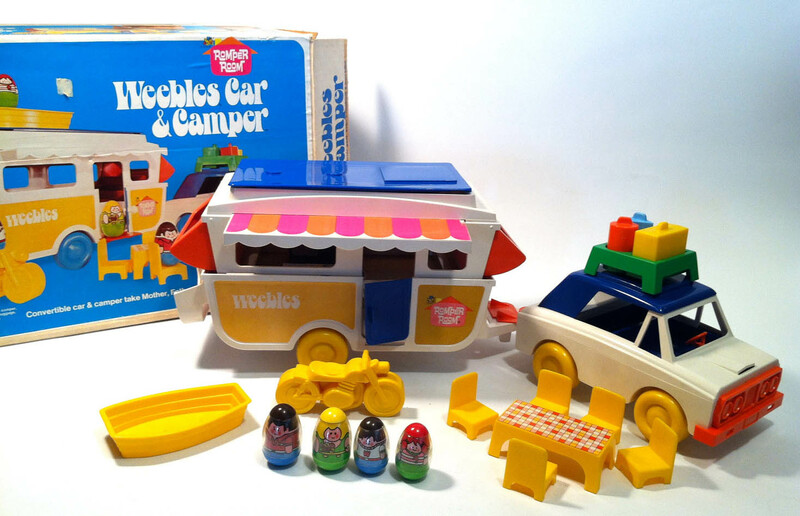 The set includes a car and camper that measure 24 long x 7-1/2" tall, a wide variety of accessories, from furniture and luggage to a family of 4. 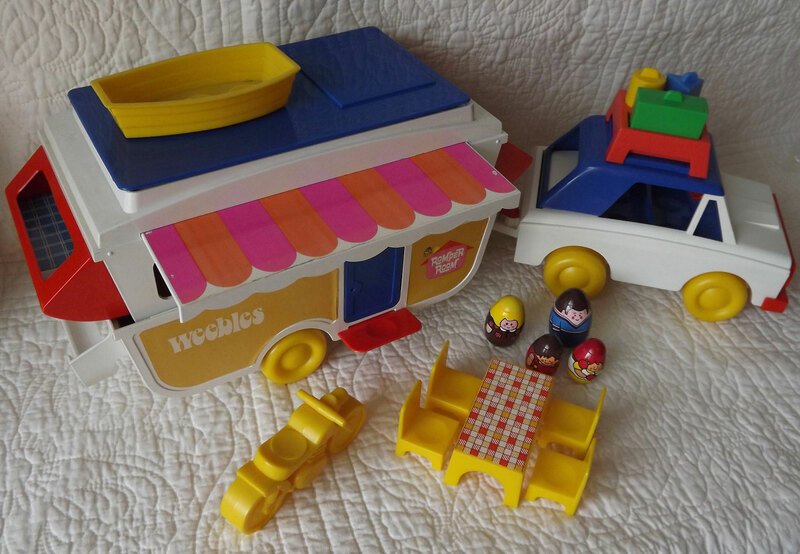 The Weeble figures were peelable (no plastic cover to protect the Weeble's body). Car - HTW100 - Large white 4-seat car with a red front grill, red steering wheel, red movable hook hitch on back, blue interior, and rolls on 4 yellow wheels. Marked, "©1972 Hasbro®, MADE IN U.S.A.". Car Roof - HTW101 - Blue L-shaped car roof/top that fits onto the top of the above mentioned car. Has 1 rectangular opening for the "back window". The top of the roof has a slightly raised square (to store/hold luggage rack). Camper - HTW102 - Large white camper with a white triangular hitch on the front (to attach to the HTW100 car), and a white motorcycle rack on the back. One side of the camper has a blue door and a red "step" under the door. The top half of the camper can be raised, and kept upright via the red swing-out window/bed on each end of the camper. The top edge of the camper has a pull-out canopy with a scolloped edge. Marked, "©1972 Hasbro®, MADE IN U.S.A.". Camper Roof - HTW103 - Blue rectangular camper roof flap (fits on top of HTW102 camper). The top of the flap has a slightly raised square 2 circles (to store/hold luggage rack and boat). Motorcycle - HTW104 - Yellow 1-seat motorcycle (no movable parts) with 2 wide wheels, molded engines on the sides, molded handlebar, headlight and seat on top. The seat has a recessed circular area in the center (seat for Weeble). Boat - HTW105 - Small yellow 3-seat boat (no movable parts). The sides of the boat are made of 3 layers of "wood" plants. 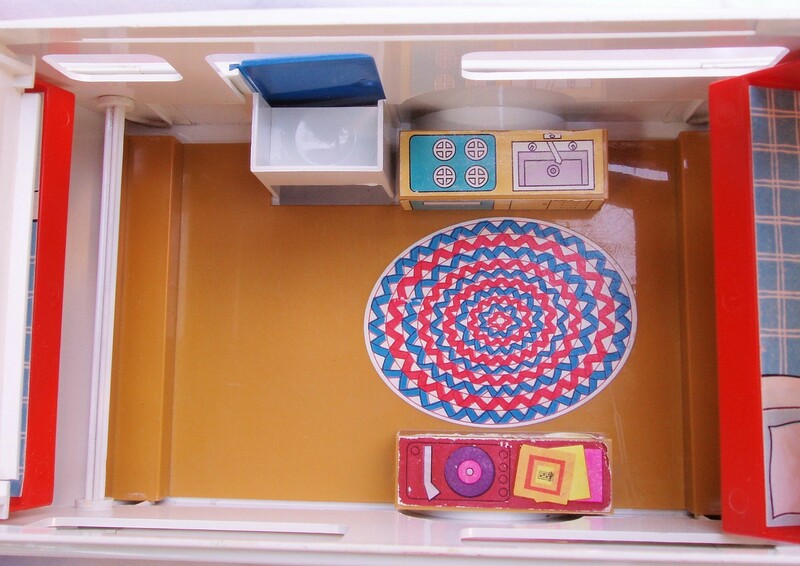 The inside bottom of the boat has 3 recessed circular area in the center (seat for Weeble). Luggage Rack - Short square luggage rack with 4 short legs (on each corner). The top of the luggage rack has 3 different shaped "holes" (rectangle, triangle, round) to hold the accessory luggage pieces. Rectangle Luggage - Rectangular luggage with a molded handle on one edge (long edge). 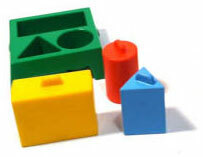 Triangle Luggage - Tall triangular (3-side) luggage with a molded handle on one end (triangular ends). Round Luggage - Tall round cylinder luggage with a molded handle on one end (round ends). Table - HTW122 - Yellow rectangular picnic table with 4 corner "legs" and a checkered picnic table cloth litho on top. 4 each - Chair - HTW123 - Yellow 1-seat chair with 4 short corner "legs" and no armrests. HTW4 - Boy - Red base, brown top (hair) boy with red overalls over a red/white striped shirt. Has a frog in his back pocket. 1973 - HTW5 - Dad - Blue base, brown top (hair), red shirt with cuffs and collar. 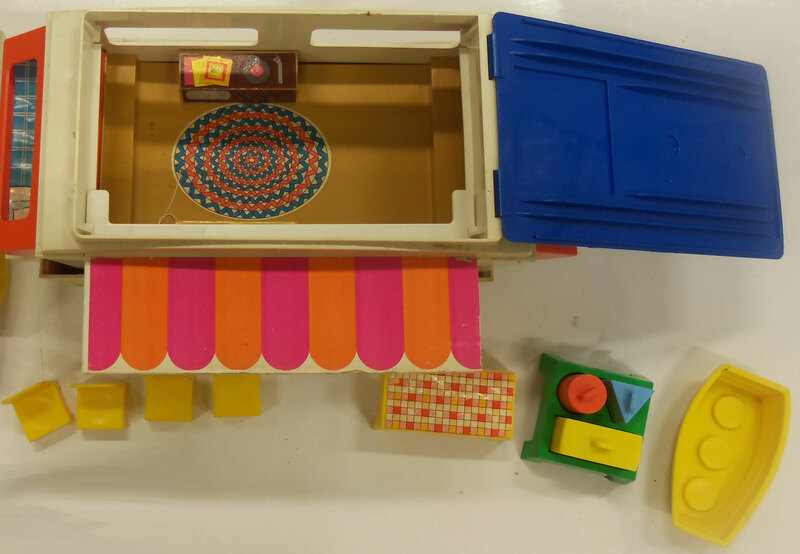 Marked "©1973 Hasbro". 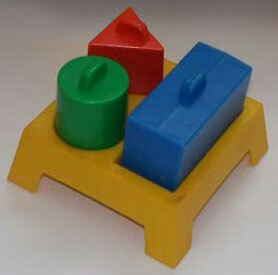 Measures 2" tall. Featured in 1972 Sears Wish Book (pg. 485) - $10.99. Featured in 1972 Spiegel Christmas Book (pg. 334) - $9.99. Featured in 1973 Eatons Christmas Book (pg. 461) - $12.99.